The FDA-approved Olympus Spiration® Valve System is now market available for the therapeutic treatment of emphysema. Placed in targeted airways of the lung during a short bronchoscopic procedure, the Spriation valve blocks airflow to the diseased portion of the lung, leading to volume reduction and allowing the healthier tissue in the remaining portion of the lung to function more effectively. 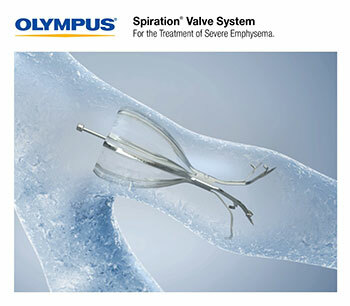 CENTER VALLEY, Pa., (March 29, 2019) – Olympus, a global technology leader in designing and delivering innovative solutions for medical and surgical procedures, among other core businesses, announced today the first endobronchial valve treatment of severe emphysema using the FDA-approved Spiration Valve System (SVS). Gerard Criner, MD, Professor and Founding Chair of the Department of Thoracic Medicine and Surgery at the Lewis Katz School of Medicine, Temple University, successfully performed the minimally invasive procedure at Temple University Hospital. FDA approval of the SVS was based on results of the EMPROVE clinical trial demonstrating that patients treated with the SVS benefited from statistically significant and clinically meaningful improvements in lung function and quality of life compared to standard of care medical management. The results showed that the SVS offers a favorable risk benefit profile, with a short procedure time.3 Previous clinical study results4 have shown that shorter procedure times may reduce the risk of adverse events. Serious adverse events observed in the study included COPD exacerbations, pneumothorax, pneumonia and death. Emphysema is a progressive form of Chronic Obstructive Pulmonary Disease (COPD) that has affected 3.4 million people in the U.S., according to the Centers for Disease Control and Prevention.5 The disease causes a loss of elasticity in lung tissue and enlargement of the alveoli. As a result, emphysematous lobes become hyperinflated, causing shortness of breath. Prominent guidelines6,7 now recommend bronchoscopic lung volume reduction using endobronchial valves as an alternative treatment option for severe emphysema to more invasive options, such as surgery. A decade of clinical studies has shown that patient selection is one of the most important predictive factors of a good response to bronchoscopic lung volume reduction with endobronchial valves.8,9,10 Patients are selected for this procedure through a screening process that involves a thorough patient evaluation, including examination for any comorbidities, and quantitative CT analysis. For more information about the SVS, please visit us at http://svs.olympusamerica.com. 1Spiration Valve System. 2018. Summary of Safety and Effectiveness. 2Criner GJ, Delage A, Voelker K. Late Breaking Abstract - Endobronchial valves for severe emphysema – 12-month results of the EMPROVE trial. European Respiratory Journal 2018;52: Suppl. 62. doi:10.1183/13993003.congress-2018.OA4928. 3Criner GJ, Delage A, Voelker KG, for the EMPROVE Trial Investigator Group. The EMPROVE Trial - a Randomized, Controlled Multicenter Clinical Study to Evaluate the Safety and Effectiveness of the Spiration® Valve System for Single Lobe Treatment of Severe Emphysema. American Thoracic Society International Conference Abstracts. 2018:A7753-A7753. doi:10.1164/ajrccm-conference.2018.197.1_ MeetingAbstracts.A7753. 4Wood DE, Nader DA, Springmeyer SC, et al. The IBV Valve trial: a multicenter, randomized, double-blind trial of endobronchial therapy for severe emphysema. J Bronchology Interv Pulmonol. 2014;21(4):288-297. 5Centers for Disease Control. Chronic Obstructive Pulmonary Disease: Basics About COPD. https://www.cdc.gov/nchs/fastats/copd.htm. Accessed March 21, 2019. 62019 Global Strategy for the Diagnosis, Management, and Prevention of COPD. Global Initiative for Chronic Obstructive Lung Disease (GOLD). 2018. http://goldcopd.org. Accessed January 11, 2019. 7National Institute for Health Care and Excellence. 2017. Endobronchial valve insertion to reduce lung volume in emphysema; Interventional procedures guidance [IPG600]. https://www.nice.org.uk/guidance/ipg600/resources/endobronchial-valve-insertion-to-reduce-lung-volume-in-emphysema-pdf-1899873854992069. Accessed January 11, 2019. 8Sciurba FC, Ernst A, Herth FJF, et al. A randomized study of endobronchial valves for advanced emphysema. New England Journal of Medicine 2010;363(13):1233-1244. doi:10.1056/NEJMoa0900928. 9Schuhmann M, Raffy P, Yi Y, et al. CT predictors of response to endobronchial valve lung reduction treatment: Comparison with Chartis. American Journal of Respiratory and Critical Care Medicine 2015;191(7):767-774. doi:10.1164/rccm.201407-1205OC. 10Herth FJF, Slebos DJ, Criner GJ, Shah PL. Endoscopic Lung Volume Reduction: An Expert Panel Recommendation - Update 2017. Respiration 2017;94(4):380-388. doi:10.1159/000479379.